the boo and the boy: Happy Valentine's Day!!! Pablo - I love you. Isabella and Simon - I love you. Happy Valentine's Day to you all!!! 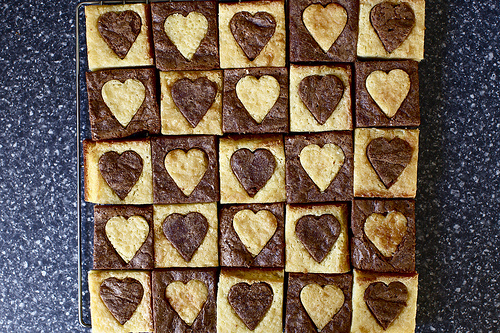 white and dark hearted brownies - courtesy of smitten kitchen. Photo is from smitten kitchen also. I am very proud to say that mine looked pretty darn close to the picture above. I hope Isabellla's class likes them! UPDATE: the brownies were a hit - I sent her to school with 18 brownies and she only came home with 4! And Pablo had a 'procedure' done at his appointment - he didn't know he was having said 'procedure' done - basically some lovely bladder tests...he said it was horrible...he is home now and going to bed. I love Smitten Kitchen! Love, love. I'm sure her class will adore the brownies--who wouldn't? 'pisser' - LOL! Good one as always! You have a great valentine's day too!